On Friday, January 27th, from 6:00pm – 9:00pm, The University of Texas at Austin’s Visual Arts Center cordially invites the public to a free, spectacular reception honoring the first four exhibitions of the 2012 season. There will be plenty of refreshments, enticing art, and knowledgeable art folk there with which to mingle. 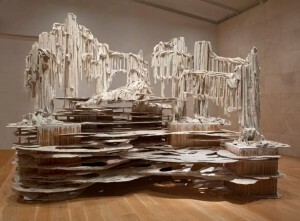 The first artist to be featured in the series is Syrian-born Brooklynite sculptor Diana Al-Hadid. Her large scale construction seems to hinge on deconstruction, all at once rising wildly and appearing to collapse in the Vaulted Gallery as part of her Suspended After Image series. This site-specific installation envisions Gothic, Northern Renaissance, and Mannerist painting in three dimensions, with disjointed and disparate spaces and forced perspectives colliding to create a metaphorical or even religious connotation. In The Arcade, you won’t be able to miss Justin Boyd’s Dubforms. The installation the converts the buildings’ grand windows into a contemporary fun house complete with audio that will transform the viewer to an alternate gallery space, familiar yet reshaped by slightly altered angles, colors, and sounds. Across the Divide is a third exhibit on display in the East Gallery that features work from 25 contemporary Chinese artists working in academia in the United States. The artists on display share a common bond of enrolling in graduate studies in America after the 1980s, yet they are distinguished by their experiences in the ‘Late-Mao’ versus ‘Post-Mao’ eras. Each artist presents a unique cross-cultural perspective that sheds light on the relationship between East and West with regards to tradition, aesthetics, politics, and the art of social critique. In the Center Space, viewers will encounter (im)possibilities, a series of works by Michael Stevenson, Erica Baum, Birgit Rathsmann, Patrick Resing, and Ellie Ga that explore Jorge Luis Borges’ metaphor of the library, or the labyrinth, in which we seek to find clear meaning where little may be yielded. This fourth and final exhibition may be the most psychologically layered and complex of the works on display, if not the most academically ambitious. Each artist employs probability theory, linguistics, mathematics, radar imaging, robotics, and fortune telling to explore our concepts of fate, how we assimilate symbols and knowledge, and the (impossibility) of certainty. The works provide the pleasant unease of not quite fully comprehending all that is taking shape, and viewers (like me) may be left with an overwhelming urge to dust off the old college copy of Borges’ Labyrinths in search of more (im)possibilities. All works will be on display at The University of Texas Visual Arts Center from January 27th – March 10th, 2012.